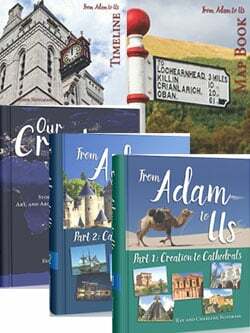 Written in a narrative style—From Adam to Us is illustrated with color photographs and maps. Help your student connect with history through primary sources, literature, and hands-on activities. 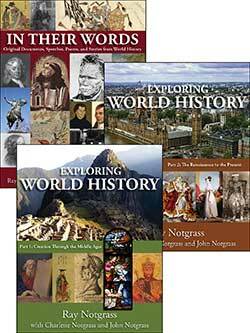 Included in the Notgrass From Adam to Us World History Set is one of each of the following items. 1. You will need one Curriculum Package—if you read the lessons aloud or if the children take turns reading the lessons from the text. 2. 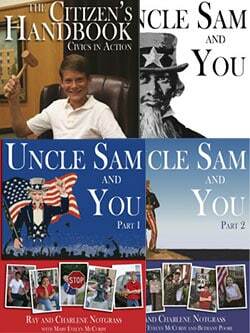 You may want to purchase the additional consumable books for each child—Not included in the Curriculum Package. Optional: Student Workbook (in grades 5-6) or Lesson Review (Grades 7-8) (One per child)—Sold separately. If you want your child to do workbook activities, answer questions, and take tests on the lessons and literature, get the workbook. 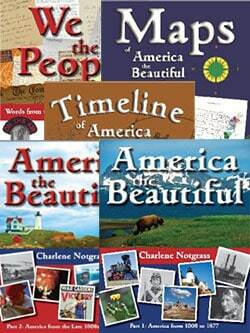 These additional books are required for the reading portion of the program. If you are using another literature course that allows you to choose books, these would be excellent choices. The Notgrass From Adam to Us World History Part 1 Text is used in the first semester with seventy-five lessons. History from Creation through the Middle Ages is covered. 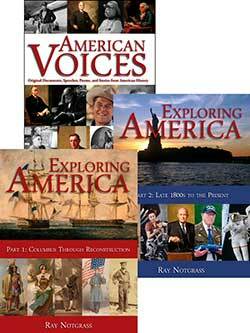 The Notgrass From Adam to Us World History Part 2 Text has seventy-five lessons in the second semester. History from the Renaissance to the present is surveyed. 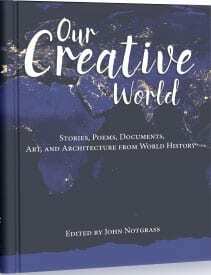 Our Creative World is a collection of original documents, speeches, poems, and stories from different periods in world history. The Student Workbook is available for the extra student. Includes crosswords, word searches, matching, and other activities. Includes literature review questions and unit tests. The Lesson Review Book is available for the extra student. Features daily lesson review questions literature review questions, and unit tests. The Timeline for Notgrass From Adam to Us is available for the extra student. After most lessons, your child will add one or more events to the timeline. An extra Map Book for From Adam to Us is available for the additional student. It is a collection of 43 maps for this study. The From Adam to Us Answer Key includes Answers for the Timeline, Student Workbook, Lesson Review and vocabulary assignments included in the main text. Taking place in ancient Egypt, The Golden Goblet is the story of the trials and tribulations of Ranofer on his quest to become a goldsmith like his father. As a child, I always enjoyed reading The Fables of Aesop. Short, clever tales from ancient Greece impart wisdom and wit to the reader. The Bronze Bow tells the story of a young Jewish man’s journey from being a vengeful zealot to becoming a follower of Jesus. It’s set in Galilee during the early first century. In 12th century Korea, Tree-ear, a 13-year-old orphan is fascinated with the potter’s craft and wants to learn all he can. Read A Single Shard to find out if he will be able to overcome the obstacles in his path to achieve his dream? Otto of the Silver Hand takes place in Medieval Germany. Raised in a monastery, young Otto returns home to find his father involved in a blood feud with the rival House of Trutz-Drachen. 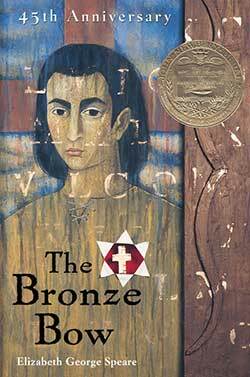 The King’s Fifth recalls the adventures of Esteban, a seventeen-year-old cartographer, with a band of conquistadors in Cibola. Read the true story of a young Hungarian prince in The Chestry Oak. Taking place during World War II, the story unfolds as young Prince Michael of Chestry lives through the Nazi occupation and finds a way to a new life in America. 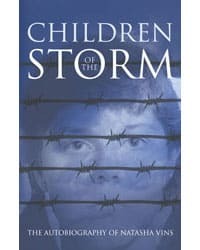 Children of the Storm is the autobiography of Natasha Vins who grew up in the Soviet Union during the 1060s and 70s. Her father was Georgi Vins, a leader in the underground church of the Soviet Union, who was imprisoned for his beliefs. In the face of persecution against Christians, will Natasha decide to submit to the government or will she follow Christ?